China’s plans for 400 nuclear reactors threaten global catastrophe, writes Oliver Tickell. In the normal way of things we could expect major accidents every few years, but with 300 reactors along China’s seismically active coast, a major tsunami would be a Fukushima on steroids – wiping out much of China and contaminating the whole planet. “China shows the way to build nuclear reactors fast and cheap.” That was the bullish headline in a Forbes magazine article last week. It went on to praise the scale of the planned nuclear investment in China’s new Five-Year Plan that runs from 2016 to 2020. Under the plan the government is to invest over US$100 billion to build seven new reactors a year until 2030. Now Conca is pretty enthusiastic about this. But the reality is a potential nuclear nightmare in the making. Experience to date shows that we should, on average, expect a major nuclear accident to take place for every 3,000 to 4,000 years of reactor operation. And with over 400 reactors running at once, it doesn’t take long to clock up those 3,000 years. In fact, you could reasonably expect a major Chernobyl or Fukushima level accident every seven to ten years – in China alone, if it pursues nuclear build on that scale. Now if China had a fantastic record of safety in its construction and other industries, maybe the odds shoold be made a bit longer. Swiss-style reactors might come in at only one big foulup every 10,000 years, for example. But that’s not China. This August past we had the massive fire and multiple explosions at the Port of Tianjin, that killed almost 200 people and devastated several square kilometres of the industrial zone. It later transpired that over 7,000 tonnes of hazardous chemicals were stored there, among them sodium cyanide, calcium carbide and ammonium and potassium nitrate, many of them kept in breach of regulations. The owners had links to the highest echelons of the Chinese state – something that may have ensured very light touch regulation. China has also experienced some recent high speed train crashes, the worst in July 2011. Two bullet trains collided head-on on a viaductin Wenzhou, Zhejiang province owing to faulty signalling, killing 40 people. The accident was blamed by the Chinese government itself on “design flaws and sloppy management”, according to the BBC. China also has a notoriously poor safety record in a range of industries from construction to coal mining. If anything we should expect China’s nuclear industry to be rather less safe that the western average, especially given the cacophony of new reactor designs and variations thereof under construction simultaneously at multiple sites with absolutely no history of operation – safe or otherwise. Another factor is the secrecy that surrounds nuclear contruction and operation in China. These matters simply are not reported on other than in glowing terms in the official press. And secrecy is all too often a cover for poor practice and cut corners. So in fact there’s a good case for thinking that Chinese reactors might pop, not one in every 3,000 to 4,000 years of operation, but rather more often. Every 2,000 years perhaps? At that rate we could expect a couple of major nuclear catastrophes every decade. How do we know what these reactors really cost? The fact is, we don’t. With China’s nuclear corporations under the control of various organs of state including the Communist Party and the Peoples Liberation Army, official statistics and accounts can simply not be relied upon. Nuclear construction in China must be cheaper than in the US and Europe due to lower labour costs. But if it really is that much cheaper it can only be at a huge safety penalty. Take the construction problems and delays at the two current EPR sites in Europe at Flamanville, France, and Olkiluoto, Finland, both now running about three times over original cost estimates. Many of the delays have been caused by safety failures. Over, for example, the flawed metallurgy of the Flamanville reactor vessel and concerns over the reliability of key valves in the cooling system. Now of course, if you simple ignore such problems and press ahead with construction to meet the targets set down a five-year plan, construction is a whole lot quicker and cheaper. But the chances of reactors popping in years to come is also considerably greater. It’s also instructive to look at the map of nuclear reactors scheduled for completion in the next decade provided by Forbes. The great bulk of them – 77 reactors in all – are built along China’s east and south coasts, for two reasons: that’s where the demand is, and that’s where the cooling water is readily available, from the sea. But of course that’s just the ones due to be completed in the next decade. If the full plan for 400 reactors by 2050 is fulfilled, probably some 300 of them would be sea-facing. There are, of course, nuclear hazards to inland reactors from flooding on the Yellow and Yangtse rivers and tributaries. But a much greater danger arises from the sea. China’s south and east coasts face out to seismically active waters. And as the Japanese discovered at Fukushima, nuclear power, earthquakes and tsunamis make a dangerous combination. Interest in the danger of tsunamis on China’s south and east coast was stimulated by the two Hengchun Earthquakes off Taiwan in December 2006, which damaged buildings and disrupted communications by severing undersea cables. One recent study put the risk of a powerful tsunami greater than 2m in height striking Hong Kong or Macau at about 10% over the coming century, mainly due to seismic activity in the Manila Trench. But head further north and east and the chances go up significantly to 13.34% at Shantou in Guangdong province. What is certain is that the tsunami hazard is real and substantial. Literature of historical seismic records of this region is “abundant”, the authors write. The northern Manila Trench near Taiwan is “is likely to have avery large earthquake in the future. In addition the regionis a volcanic belt. If volcano and earthquake occur in concert, a much larger tsunami disaster would develop. “Although the southern part of the Manila Trench is far away from the coast of China, the local historical records of this region have many tsunami earthquakes up to the magnitude of around 8.0. Since the oceanic portion of the South China Sea is mostly deep, tsunamic waves generated in the Manila Trench region can reach the coast of China with little loss in energy. I have done no study of the tsunami vulnerability of all the 300 nuclear reactors that could end up being built along China’s east and south coasts. But at least one – the CANDU reactor shown in the photo (above right) at Qinshan, where seven reactors are currently operational, looks vulnerable in the extreme. And the consequences of a really big earthquake and tsunami hitting China’s coastal array of 300 nuclear reactors would be catastrophic. Many dozens of reactors could be struck down, each doing their own ‘Fukushima’. This would not just bring massive radioactive contamination to China’s most developed, prosperous, productive and populated regions, but spread around the world in air and sea currents to make the world’s first truly global nuclear catastrophe. The only good news in all this is that nuclear construction in China is not proceeding anything like as fast as Forbes magazine claims. 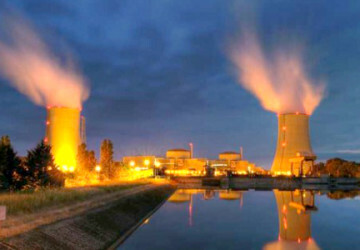 Most of the more modern ‘Generation III’ reactors are well behind in their completion times, echoing the European experience with the failed EPR design. We can only hope that construction difficulties persist and abound – and that China’s rulers realise that investments in solar, wind and other renewables are a quicker, surer, safer way to bring power to the masses – and one that poses no existential threat to their country, and the world.